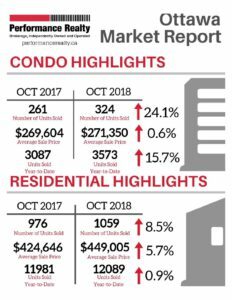 The number of condo units sold is up over 24% from the same time last year, while the average price stayed very close to the same. The relative affordability of condos is attracting many first-time home buyers. Residential units sold was up 8.5% and the average sale price increased by 5.7%. Ottawa is still facing a “shortage” of homes for sale, and the imbalance between supply and demand is pushing up home prices.